Despite the somewhat tempremental weather, I think we can all agree by the welcoming (intermittent) rays of sunshine and pretty pink blossoms (and the fact that it's now May - wha?!) that spring has officially sprung. Spring is my absolute favourite time of the year for fashion and beauty - spring always means an influx of pastels and florals, which are, obviously, two of my favourite things. I love injecting a bit of fun into both my wardrobe and my makeup bag with pretty pinks and lilacs, mint greens and baby blues - all of the sugary sweet, happy hues. So, I thought it was about time I ran through the makeup products that have my heart all a flutter for spring. First up, I've been loving Bourjois' new Color Edition 24 hour cream eyeshadows - particularly the shade 01 Merveille D'argent* - a stunning sparkly white with hints of gold. Whilst I'm not usually the biggest fan of cream shadows, this cream to powder formulation is really nice, although it did take some getting used to - I just really love how sparkly this shadow is. Another spring favourite from Bourjois is their eyeshadow quad in Over Rose* is full of beautiful pinks for the perfect spring evening look. I'm particularly in love with the 'light touch' top coat in the centre - the most sparkly pale pink with gold glitter ever. MeMeMe's 'Beat the Blues' highlighter* is the perfect spring-like pale pink, and is ideal for adding a really subtle pink highlight to the usual highlighting areas. In terms of blush, I usually like to keep things very baby pink during the spring months but I couldn't resist popping this Laura Geller 'Blush n Brighten' in Pink Grapefruit* into the mix. I adore mineral blushes and this one ticks all the boxes for me - it's such a stunning warm pink that would make a great transitional shade from spring into summer too. For lips, if you want to keep things subtle and super hydrated, then Clarins Instant Light Lip Balm Perfector in Rose* is perfect - it feels amazing and moisturising on the lips, and gives a really subtle sweet rose colour. If matte lips are more your thing, then Bourjois Rouge Edition Velvet in So Hap'pink* is a really lovely bright pink that stays on amazingly well (see a full review of the new shades here). For lashes, I think spring is all about going for big, fluttery doll eyes, and these lashes from Invogue* are perfect - just the right amount of length, volume and flutter to achieve gorgeous bambi doll eyes. Last but not least - nail polish. One of my favourite things about spring makeup has got to be all the gorgeous nail polishes hitting the shelves. Bourjois So Laque Glossy nail polish in Peace and Mauve* is a lovely pale lilac, although it does take a fair few coats to look opaque. If you prefer your polish pink, then OPI's 'I think in pink'* is a gorgeous sugary pink, although, again, it needs a fair few coats to make an impact. Finally, my favourite of the polishes, Givenchy's Rose Evocation* is a Limited Edition stunning deep Barbie pink, in an incredible formulation that dries quickly and gives a semi-matte finish. I feel like this nail polish needs a review all on its own as I'm so impressed with it! So there you have it - my picks for spring. 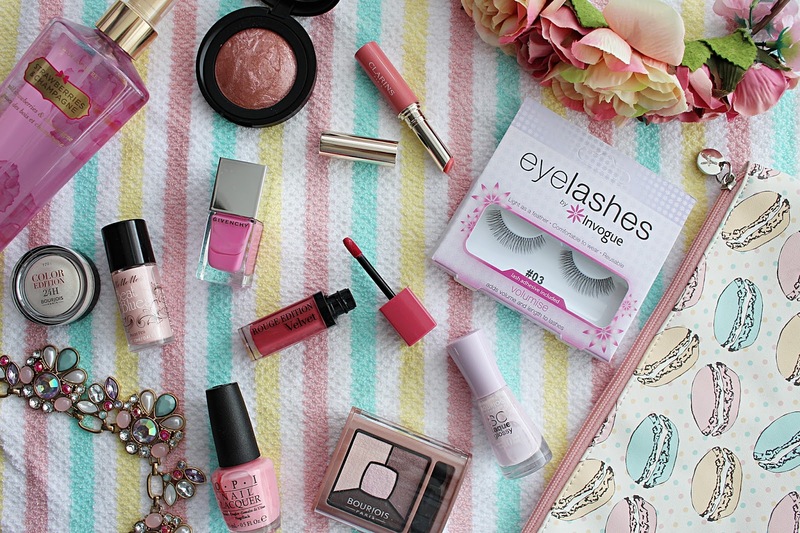 What cosmetics are you currently loving this spring? Let me know!